As we come to the end of this week, it’s hard to believe that the 2014 Bologna Symposium is at its halfway point. As a graduate of the 2013 Hague Symposium, I know all too well how quickly the time flies. We’ve now ‘settled in’ to our IPSI family but have not yet approached the unhappy reality of goodbyes and long journeys home. We are asking more questions, challenging the simulations, and using our ever-growing knowledge to our best advantage. On Thursday we were treated to another brilliant day with Wilbur Perlot, expert negotiator from the Clingendael Institute in The Hague. I had the pleasure of learning from Wilbur last year and this represented a second chance to engage with him and draw from his wealth of negotiation experience. We spent the better part of the morning going over the lessons we’d learned from the ‘Crocodile River’ case study conducted the day before. The study asked us to rank a series of characters based on our perception of their morality and then negotiate with our peers to form a group consensus. It is extremely difficult to take those lessons into account when you sit across from your friends and peers, trying desperately to secure the outcome you want and even need in that moment. Practice, practice, practice and a thorough review of each simulation is the most effective way to hammer home these lessons. The afternoon, therefore, involved yet another exercise, which plunged us into the 1990s and asked us to form a successful loan agreement between Uganda and The World Bank. One of the major issues that faced our group–and indeed that faced the class as a whole during the crocodile river test–was setting and conforming to rules and procedures that allowed every party a voice. Power dynamics are both easy to forget and easily manipulated; setting ground rules diminishes the likelihood of any one participant “railroading” the others. Although equal power may be a utopian ideal for global politics, listening and patience are two of the most critical skills for us to assimilate at this early stage of our careers. Despite the dearth of procedural structure, our group managed to hammer out a deal that both the Uganda and World Bank teams signed on to. We parted with a sense of satisfaction, handshakes, and smiles. Nevertheless, I know we can do better with more practice, with time to think in order to give more careful consideration to Wilbur’s lessons. 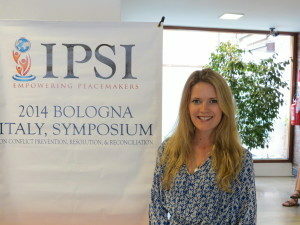 I intend to savor every moment of the second half of The Bologna Symposium because every minute spent here is another opportunity to learn something new, to bond with my peers, and to create new IPSI traditions. I can’t wait!